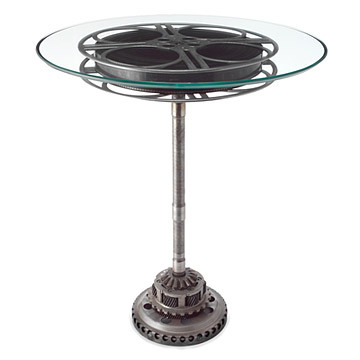 Bring the big screen to your home with this table, made with 1930s aluminum 35mm film reel. Bring the big screen to your home or office with this one-of-a-kind table made with an original aluminum 35mm film reel from the 1930s. Sandwiched between two sheets of glass and offset by a steel base made with salvaged gear parts, this unique side table is sure to draw a huge audience. Handmade by Breck Armstrong in the USA. The film reel table is adjustable with a side handle that turns, allowing the top to move up and down. Very Impressed, Love your site!!! Great table, thet loved it!!!! Have had this product for a year now. Still enjoy looking at it and using it. Each one is hand made and unique. A definite conversation piece. It makes a timeless statement to any decor.